An Intriguing Cool Find! : Dynamax Tour de France! I had seen this bike listed on Craigslist numerous times. The price seemed reasonable, but it wasn’t right for me to make the hour long trip. As usual, the CL photo didn’t reveal the details that I needed to know so I never made a call. Then one day, I saw the bike listed on Ebay. Now I could see the details better. The bike intrigued me, and I decided to bid. After the five day bidding period, my opening bid won the bike. When I picked the bike up, I was impressed with it. Although the steel rims and high tensile steel tubes indicate an entry level bike, I was impressed with its character. 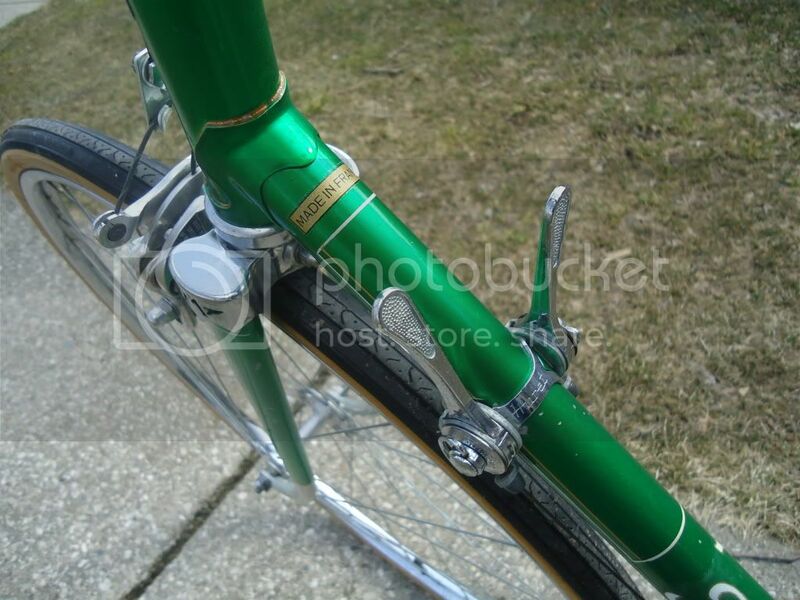 The lugs, highlights, foil decals, Motobecane “M” markers, and metallic green paint had me smitten! Although I will likely sell it someday, for now I’m happy to have it in my collection. I have done my homework, but I can’t find much information about Dynamax. From what I’ve gathered, Motobecane was prevented from marketing their bikes under their name in Canada. So Motobecane rebadged their bikes in order to enter the Canadian market. If you look at the fork, you can see the Motobecane “M” in the crown. Otherwise, I don’t know very much about the bike. 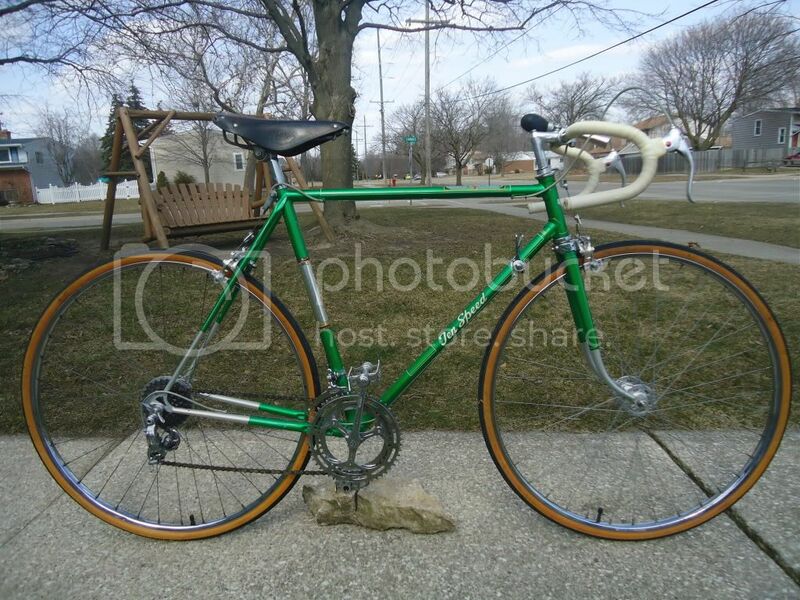 I would appreciate help in identifying the year and Motobecane equivalent. I absolutely love the decal on the top tube. Any help would be appreciated. It might be low end but it's a good looking bike for sure. I'm a sucker for French bike boom stuff though. wow, there's a lot to like in that thing. Cool find! Yes, we definitely need more horns! That sure is a beauty Bikeman ! Hierarchically speaking, it seems to fall between the Nomad and the Mirage c. 72/3. The Allvit DR's put it down with the Nomad but the hubs look like nice Normandy alloys as on the Mirage. Graphics-wise, it beats out everything! Awesome. The tour de france decal alone is worth whatever you paid for it. Digging that Tour de France decal. And those hubs. And that fact it boldly proclaims "10 Speed"
Interestingly, I wish I didn't like it. As to quality, it would be the lowest in my collection. However, as to being distinctive, it is unlike any other in my collection. I'm a sucker for green bikes. It is almost Cool and chessy at the same time. It might be its chessiness that make it cool. Regardless, I think it is great! Thanks Auchen! Your placement in the lineup is very helpful! The downtube is cool, but the top tube decal makes the bike. Without it, the bike is not the same. Agreed many times over. In fact, I liked the bike so much that I paid the previous owner $25 more for the bike. Some might think I'm foolish, but I was happy to get it. It far exceeded my expectations. 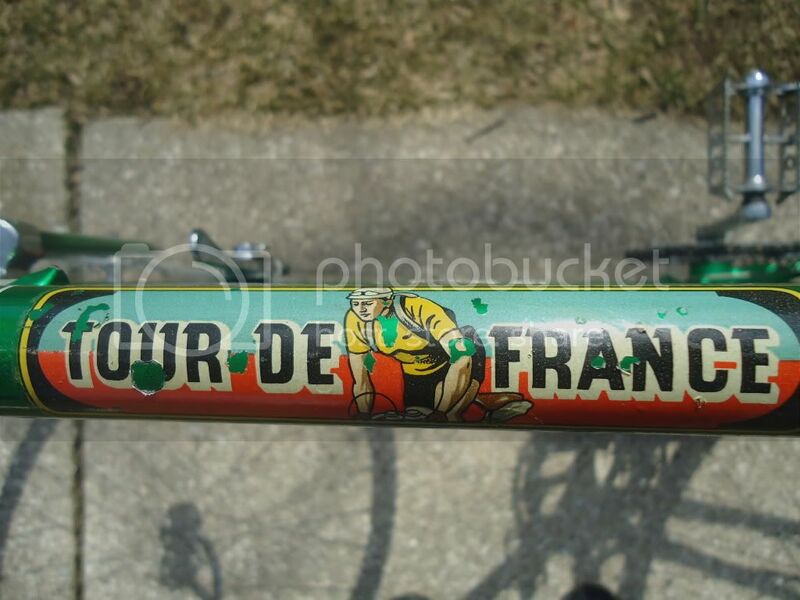 When I saw first saw the Tour de France decal in photos, I thought it was a sticker placed on by a previous owner. I was pleased when I saw that it was a company decal. Thanks for your input! 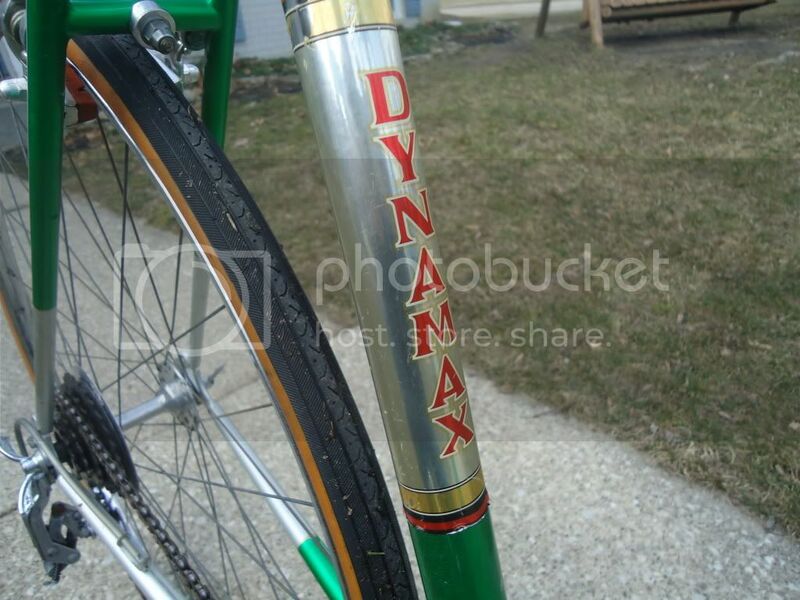 I believe the Dynamax bike in your photos dates back to ~ 1961 based on a Dynamax 10-speed I received as a Christmas gift in 1961. 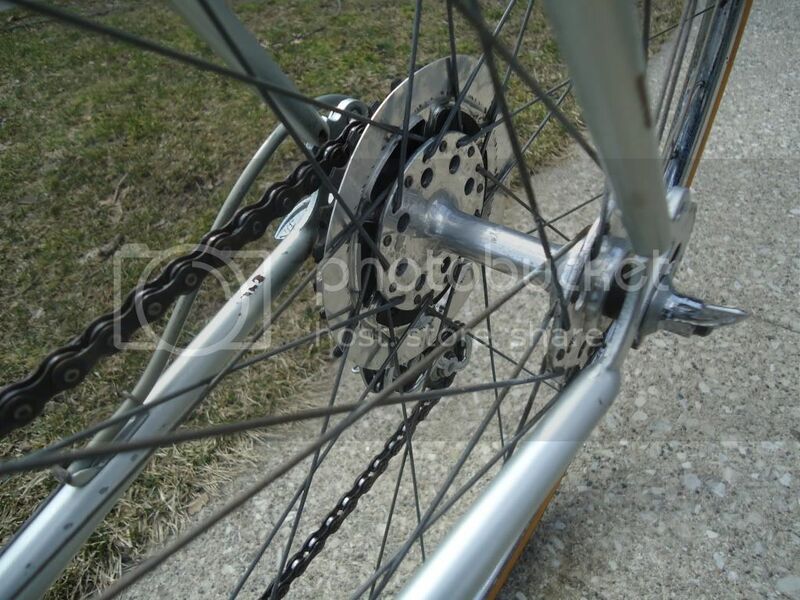 My Dynamax bike had the wing nuts on the wheels like yours, and all the components were of the same manufacturer. Unfortunately that bicycle was stolen in November of 1963. The replacement Dynamax I received as a Christmas gift in 1963 did not have the wing nuts for the wheels. This seems to date your bicycle to around 1961. I think I am correct in stating this was a rather high quality bicycle for its time. 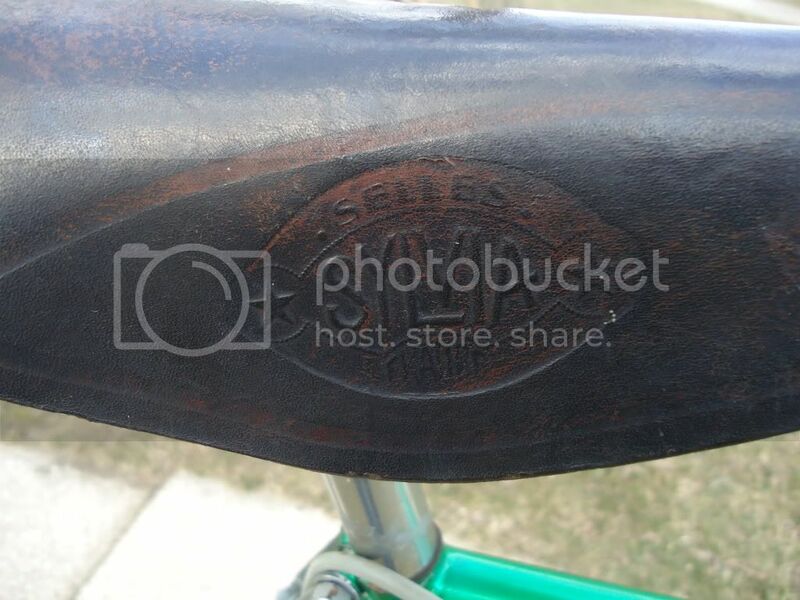 I still have the '63, although it has been updated with aluminum wheels, Shimano deraileurs, and cushioned seat - the original leather seat was way too hard. I am amazed at the condition of your bicycle, it barely looks ridden! This is a beautiful bike. I really, really don't need another bike. 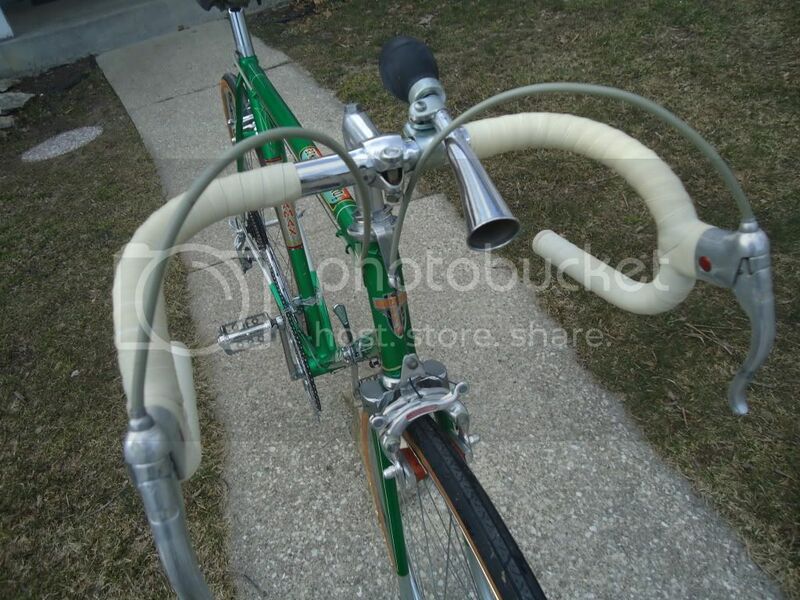 But I fell off the wagon yesterday (I picked up a bianchi equinox because I'm a sucker for cross bikes and suntour xc pro gear) and I would do so again in a heartbeat if I found something cool and old and French like this bike! This bike reminds me of my Steyr Clubman, a bike that for me has the sort of appeal that caught bikemanbob's attention. And I consider bikes like this to be more like 1950's bikes, though actually built around the 1960's into the early 1970's. Similarly, the Clubman seems to have been in production during a fairly static 10 years, from about 1961 to 1972 or so, with the big change during those years typically being the crankset gearing, which during the early-mid 1960's typically changed from half-step to something like 40-52t or even 36-52t. While this bike's hubs initially threw me for a loop, the rear hub's very wide flange spacing on the non-drive side was still being done by Atom during the 1970 bike boom. And the calipers on this one have the curved decals instead of the previous stamped lettering, hinting at later than mid-1960's. The brake levers I really can't put a date on, they're cool though. 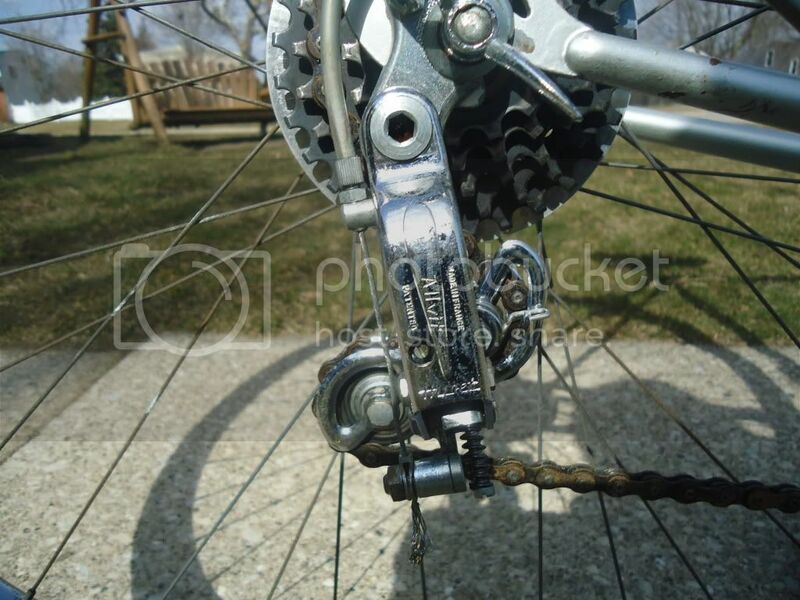 An early-60's front Allvit derailer will have a sliding-post adjustment where the cage is secured to the linkage. Rear Allvit's work well with medium-range 5-speed freewheels, can easily be modded for 6. The freewheel ratios suggest 1960's to me, the 14-26t was popular then. What brand of rims are those? 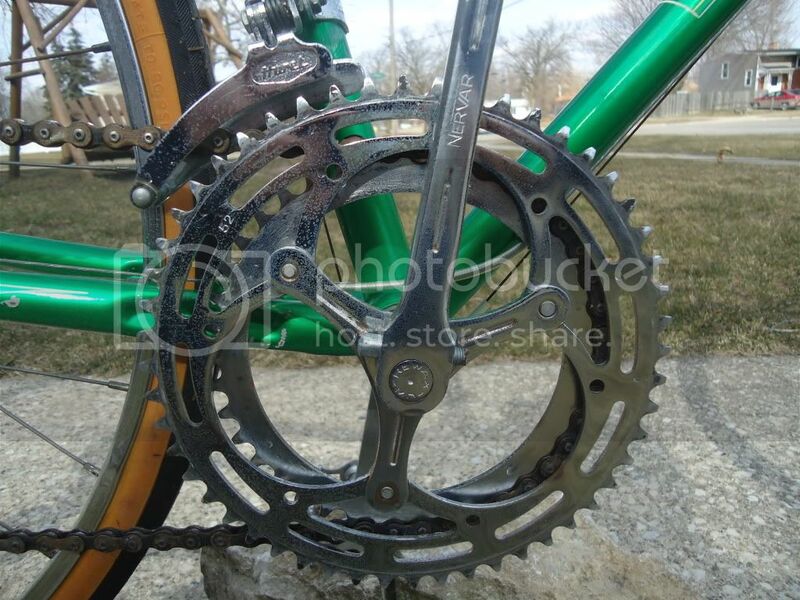 That Nervar crankset is a pretty good unit for a steel crank. Those wingnuts should work well if kept well-oiled at the threads and washers. Did I mention that I think this bike is from the late 1960's? The frame's painted-on "box lining" gives this bike a much older look (as on my Steyr, which is actually from around 1972). Nice find! I think that bikes like this are under-rated if/when the rider is a good fit on the particular bike. Good luck finding any date codes on this one. The whole bike is freaking awesome, but the graphics would be the deal sealer for me too. Numero Uno or should I say numero ou chiffre un? Freaking awesome is the best description yet of this bike. Even that huret allvit which is a boat anchor of a derailleur just looks so right on this bike. The pic of that TdeF rider with the tubie wrapped around his shoulders is so cool. Last edited by bikemig; 05-06-14 at 05:15 PM. Wonderful. Simply wonderful. Was it in that spanking newish condition when you picked it up? Very clean old machine. The head badge is very reminiscent of the old Motobecane Pantin badge. I have almost exactly the same bike but it shows the original Motobecane labeling. It is a Pantin model. I bought mine in 1966 in La Jolla, CA. I believe it was new when I bought it, but I don't know how long the dealer had it. An earlier poster said it should be before 1963 because it has the wing nuts on the wheels. One small difference is that the saddle is a Selles Ecco 105. I am refurbishing it now. Mine is bright blue with white trim. for now I’m happy to have it in my collection. You should be, it's nice old bike in excellent nick. It pre-dates the boom era Nomade & Mirage so early '60's sounds right. Motobecane in my opinion was the finest quality French production bike of the era. Straight, very well finished and equipped they had a great ride quality regardless of price point. The factory understood International trade and packed the machines into sturdy shipping cartons to survive the cross Atlantic supply chain unscathed, as you can see. 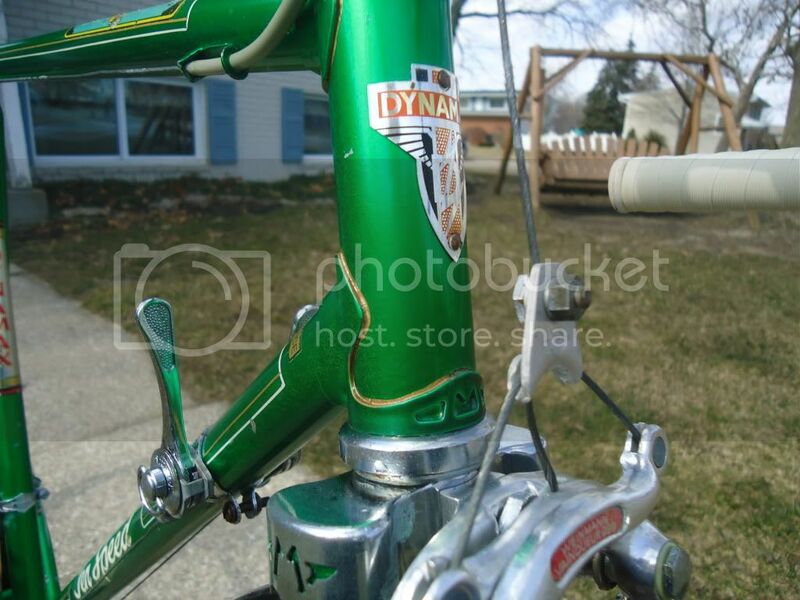 Dynamax was, maybe still is, the bike house brand of Home Hardware stores here in Canada. Motobecane would have made these bikes for them just as they produced bikes for the Eaton's department stores for a short while as well.